When we visit a foreign land, the first thing which troubles our brain, is the local language of that country, if we are not fluent with it, it might lead to some disastrous experience of our trip. No doubt the Google Translate is a pretty handy tool for this problem but at times the translation might not necessarily be what we’re trying to convey, which is why Google needs our help in fine tuning the process. This has led to the launch of an app called Crowdsource. 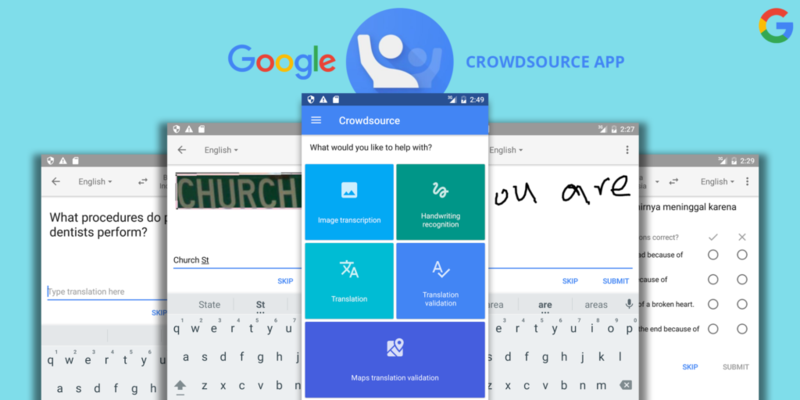 This is a remarkable Google application, which has been introduced on Google Play- Crowdsource, it’s a unique application of its kind, and it asks the users to translate and transcript images or text. As Google has confirmed, this is a pilot project. Once the app is started first time, user is asked for the language he/she is fluent in; ultimately it will lead to the more options within the various categories. Once complete, user is given with 5 different sections that allow them to translate or transcribe their desired content. Beyond that, it features large buttons that let the user to choose from a selection of micro-tasks like image transcription, handwriting recognition, translation and translation validation, as well as map translation validation. Millions of people rely on Google’s services daily, whether that’s Google Maps, Google Translate, or even just Google Search. Now the company is asking for users help to further improve those services, just a few seconds at a time. Users can do this by helping out with image transcription, handwriting recognition, translation, translation validation, and maps translation validation. Users who are fluent in multiple languages can help out with the translation aspect, but if the user is unable to, they can still help out with image transcription and handwriting recognition. Image transcription takes blurry images of signs (usually street signs), and asks to type out what they think it says. It can be downloaded via the Google Play Store, right now, the app is only available for Android and it does not appear that there are plans for an iOS version yet.